Keep your bonsai in a well lighted area they grow best in a location which receives morning sun and afternoon shade. The morning sun is not as hot and dehydrating as the afternoon sun. Bonsai are not houseplants so they should be kept outdoors. A screen porch is ideal there they can receive filtered light. You need to protect them from strong winds and temperature extremes. Proper watering is critical. 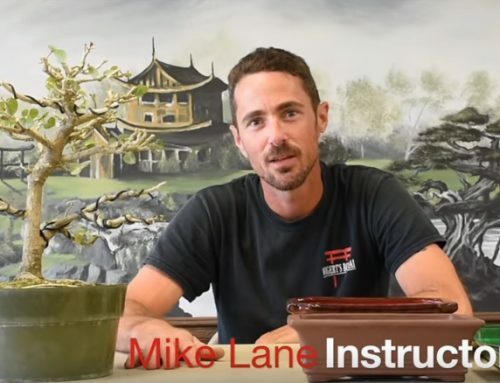 Knowing when your tree needs water is one of the most essential skills of bonsai success. The trees must never dry out completely, and because they are in such a shallow container, it can easily happen. The bonsai has a bare minimum of soil, once it has been allowed to get bone dry, the tree may die or be severely damaged. Therefore, you need to check the tree often. One of the main problems with house plants arises from over watering, but with bonsai, one of the most immediate problems is under watering. Bonsai soil is a course mix consisting of pine bark, baked clay and gravel. It is well draining and you need to make checking the tree for water a part of your daily routine. It might help to place the tree in a spot where you are not likely to overlook it, to help remind you to check its dryness level. When you water, make sure your soil is thoroughly saturated. If your bonsai is small, one method of ensuring your tree is sufficiently watered with out washing away loose soil or gravel at the top of the pot is to set the pot in water so that water is soaked up through the drainage holes. Pouring water on from the top as with house plants is likely to make the water run off the surface and you simply cannot assure that the roots get the moisture they need. If you use a soft spray from a sprayer or a “soaker nozzle” that attaches to your garden hose make sure the plant gets a through degree of saturation, even if it means having to come back to the tree two or three times. Do this until the excess water seeps out the bottom drainage holes to be sure that all the roots have been completely watered. Fertilizing is recommended. Dynamite (18-6-8) is a 6 month slow release. Apply a small amount inside the outer top edge of the pot – so as to encourage the roots to grow out to it. If you have recently purchased your tree from Wigert’s Mango Grove and Nursery wait at least 4 months before adding Dynamite as it has already been applied! It is fine to supplement, however, with a water soluble fertilizer such as Miracle Grow or Peters at half strength (1/2 tablespoon per gallon of water) every 10-14 days-mist the foliage as well as saturating the roots. Because bonsai are watered so frequently, and so thoroughly, a lot of the nutrients the tree needs are constantly being leeched out. Therefore, regular fertilizing is important. Insect Control is important, common insects that attack plants will also attack bonsai. Your tree needs to be looked at and monitored often for any signs of insects. You may use pesticides that are labeled ‘safe for houseplants’ on your bonsai. Take care to follow label instructions, and never spray the tree when it is in full sun. Spray plants in the evening or move to a shady location. If you have questions about a specific pest or pesticide please contact us for more information. Moss is used primarily for ornamental purposes. Probably the best way to get fresh moss for your trees is to simply go out and scoop some up. There are many varieties of moss but even the best ones will tend to lose color and turn brown with time. If moss can’t be maintained, adding fresh gravel to the surface of the pot helps keep an attractive appearance. Remember your bonsai is not an artificial plant. It will have times when it looks better than others. Often, after a plant has been moved to a new location it needs time to acclimate, so don’t panic if it experiences some leaf dropping or goes through an adjustment period. It is nice to have several trees so that you can take turns displaying the ones that look their best. If you lose a tree, your not a failure, even the “experts” lose trees from time to time. There are many good books on the market and local Bonsai Clubs all over the country that can help educate you further on the subject. Bonsai is a great hobby, so give it a try, learn from experience, and enjoy this age-old form of living art!